Ahmed Sékou Touré, first president of Guinea, trade unionist, Pan-Africanist and authoritarian leader, was born on January 9, 1922 at Faranah, Guinea, a town on the banks of the Niger River. His parents, Alpha Touré and Aminata Fadiga, were peasant farmers of the Malinké ethnic group. Sékou Touré was first educated at the local Koranic school and pursued further studies at the regional school of Kissidougou, south Guinea. In 1938, he was expelled from school in Conakry, Guinea’s capital, for leading a hunger strike. He continued educating himself through correspondence courses while taking on various jobs. A member of the Post and Telecommunications Department, Sékou Touré formed Guinea’s first trade union, the Post, Telegraph and Telephone Workers’ Union, in 1945. He participated in the founding of the Pan-African Democratic African Rally (RDA) in 1946 and was nominated secretary general of the Democratic Party of Guinea, the regional branch of the RDA, in 1952. He also helped create the country’s first general trade union in 1946, the Federation of Workers’ Union of Guinea which was associated with the French communist-led trade union movement. Devoting most of his time to trade union work, Touré lead strikes and protests often openly against French Colonial rule. In 1956, Sékou Touré was nominated Mayor of Conakry and elected a deputy to the French National Assembly in Paris. By 1957, he was Vice President of Guinea and was soon empowered to form the colony’s first autonomous government under control of a French Governor. On October 2, 1958, Touré proclaimed Guinea’s independence making it the first West African country liberated from French governance. Deprived of French support, President Sékou Touré developed close links with Ghana under Kwame Nkrumah. He also sought economic support from the Soviet Union, China, and the U.S. In the early 1960s Touré also developed Pan-African ideologies, combining efforts with other African leaders to establish a union of African states. The Organization of African Unity founded in 1963 is an outgrowth of his efforts. Sékou Touré ruled Guinea with political values close to socialism and based on a one-party system. His rule quickly showed the characteristics of a dictatorship with arrests of government opponents and executions. He also drove many dissents into exile. Despite Guinea’s rich natural resources, economic development of the country remained slow, impeded by poverty, corruption, and few foreign capital investments. 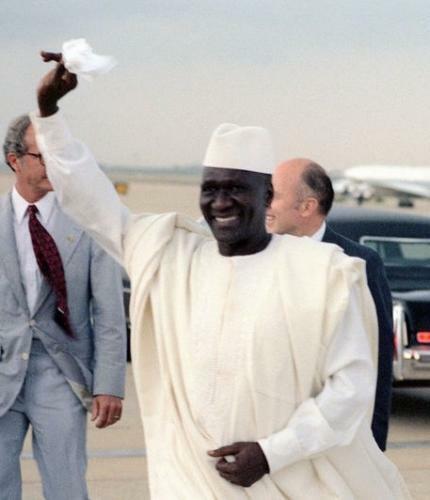 President Sékou Touré, urgently transported in the U.S. due to serious heart condition, died of a heart failure in a hospital in Cleveland, Ohio, on March 26, 1984. Lansana Béavogui took the country in charge as interim president and declared a forty-day national mourning. Hakim Adi and Marika Sherwood, Pan-African history: political figures from Africa and the Diaspora since 1787 (New York: Routledge, 2003); Ibrahima Baba Kaké, Sékou Touré: le héros et le tyran (Paris: Jeune Afrique livres, 1987).